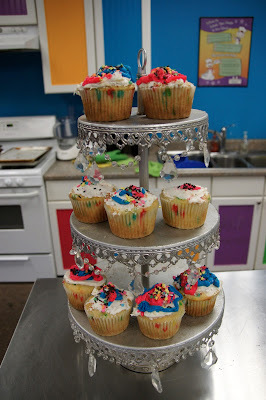 Family Food Finds: Fourth Birthday Party! A few weeks ago, my oldest baby turned 4. I can't believe how fast time flies! 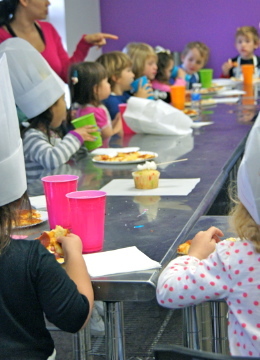 Given our love of food and cooking, we decided to have a pizza-making party at my local Young Chef's Academy. It was our first time visiting this establishment, and I was so impressed! The kitchen was bright and colorful, adding to the fun for the kids. They were all set up when we arrived and I took a quick look around. We set up the food for the adults. We brought in sandwiches, fruit, veggies, biscotti, and mini desserts. The prep counter was set up with chef hats and crayons for the kids to decorate with. Each of them had a great time drawing and customizing their own hat. The various pizza toppings were all set out and ready for the hungry kids to add to their pizzas. They used "magic" to skip the rising step of the dough making, and allowed the kids to get right to work. Each child got an equal-sized portion and began kneading away. The chef instructors went around and shaped the dough into a variety fun shapes like mermaids, butterflies, bunnies, snakes, cars, etc. The kids LOVED that part! Next, the toppings came out and the kids were let loose to top however they wanted. While the pizzas were baking, it was time to decorate the cupcakes. In lieu of a sheet cake, we opted to let each child decorate their own dessert. The finished desserts! Everyone sang to the birthday girl, and they all enjoyed their creations. The adults were able to relax and have fun watching their kids cook. It was such a great experience. I hope to find an activity just as fun for her next birthday! this looks so adorable and fun!